Richard and I as well as Steve and Joan Mann spent most of January and February in Zambia catching up with ZMF-C people and projects. The Hoeppner family and Marlene and Randy McClure joined us for a few of those weeks. I was able to be with Milk Program manager, Nancy Siazilo, her assistant, Mrs. Muntanga and 19 babies and families for the “milk Mondays” which take place at 7 Fountains Farm each 3rd Monday of the month. Again, I have to pass on GREAT thanks to you, the donors, from those families you’ve helped! They are truly grateful!! To summarize – the milk program serves an average of 10 babies monthly for a duration of approximately one year. Some months perhaps 13 will show up, others it might be less. Some babies may be on the program only for a few months, some longer. The program is designed to target the specific needs and circumstances of each baby and family. Beyond the distributing of milk formula, the aim is to share the love of Jesus through actions such as observation and listening and expressing words of encouragement. Every contact with a family is a story! I will attempt to communicate with you some of the challenges and blessings through the next few reports and also ask you to join me in prayer for God’s justice in these situations! First of all, I’ll share a few excerpts from “Rich Christians in an age of Hunger” by Ronald J. Sider (2005), a book loaned to me from Steve during our time together. 2.Poverty means illiteracy, inadequate medical care, disease, and brain damage. And while in Zambia I was reminded of our luxurious Canadian health care system. 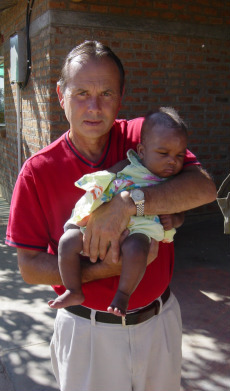 •Zambia infant mortality rate is 8 times GREATER than in Canada. •Maternal death rate is 591 per 100,000 live births in Zambia. Canada’s maternal death rate is 6 – 11 per 100,000 live births. (Example: Osco Moodoomo was married about one year ago. His wife died a few weeks ago attempting to deliver their first child. Osco is in his early 30’s. He is employed as a Social Worker after recently graduating from University of Zambia. He was one of our sweet former ZMF-C sponsored students and interned with me as a Social worker in 2013/14). The death of Osco’s wife will become a statistic – but more than that, it’s a painful a reality! My heart aches for Osco and his wife’s family. •HIV prevalence for females in still high at 16.1%. Last is 4 months old and has outlived his 2 siblings. One died at age 1 week, the other at 1 month. He is unkempt and underweight, but apparently brighter than a few weeks ago. His mother and granny’s lethargic bodies and downcast appearance were telling of their challenging life circumstances. They had travelled a long way to 7 Fountains Farm to receive milk formula for baby Last. When I saw Last in January he had no proper bottle. He’d been feeding off of a toddler sippy cup that had a few of the holes fused by melting the plastic with a hot knife. I asked, “How much does he vomit?” – “after every feed” the mom replied. Surprisingly, he had gained a little weight. He was given a bottle! Will keep you posted as Nancy and Mrs. Muntanga attempt to keep connected with this family. In the meantime, God introduced me to a sweet Social Worker at the Gender Based Violence organization based in Kalomo. A suggestion has been made to connect the mother with this Social Worker. Prosper is 3 months old in this phot. His 21 year old mother was buried the day prior to this photo. Prosper was to be taken care of by this aunty and they came to the milk program accompanied by one of our ZMF-C sponsored teachers. A few weeks after the photo was taken baby Prosper died. Why did the mom die? No clear explanation. “She had pains during her pregnancy that continued until she died”. Prosper was breast fed until the day mom died. Baby Prosper appeared to be relatively healthy. 2nd question: Why did Prosper die? Poverty means unsatisfactorily explained reasons for maternal and infant death. Their village is several kilometers from the nearest rural health clinic. Often times I’ve seen the donkey and cart on the dirt road in that area loaded with a newborn and a new mom – within 24 hours of delivering. One local doctor I knew described rural health care as bush medicine. General challenges for rural clinics include lack of medicines, lack of adequate staffing, lack of infrastructure. I couldn’t help but put in ANOTHER photo of Lubono! What’s your reaction? If you have received reports in the past you’ve heard us mention Lubono, now 3 years old. She has Down’s syndrome, and is talking, walking and dancing! She makes us laugh! She loves an audience. Her hair is still copper colored, but overall this girl is full of energy! It was fun to watch her make her airy, green dress float like feathers! Lubono’s mom is dedicated and after travelling a LONG way for milk days she’d take Lubono to Namwianga Clinic for physiotherapy and education on how to help Lubono start to meet her developmental milestones. This is the longest we’ve kept a child on the program, but the rationale is that she needed all the help she could get so that her brain could receive optimal nutrition. Psalm 37 – Day by day, the Lord takes care of the innocent, and they will receive an inheritance that lasts FOREVER! Currently, 10 babies are receiving the gift of milk! This month only about the families came to receive the milk as Nancy had given some families extra last month. Why??? The rainy season this year has been UNBELIEVABLE and roads are trecherous and unreliable! Next month we will give some details on some of the new babies and their families! Thanks for your contributions and you can see the difference you’ve made! We thank God again for the privilege to serve in His Kingdom and give a report on the distribution of milk for the month of May. It is great to report that there is change of weather though on this particular day we experienced some cloudiness. Daytime temperatures have dropped from 30 to 25 degrees Celsius. Nights are also getting cooler. Last night the reading was 9 degrees. Brrr..
tragedy. There is a high possibility that Esther was HIV positive and untreated. Very sad! This drops the number in the program to 12. Lusyomo Nyeleti; this is the last month on the program. We are happy to note that this girl looks healthy and no doubt she will continue doing well thereafter. Charity Kabati is not in good health. Under 5 card shows a reduction of 1kg. The reason given was that she was sick. We hope she will be able to gain her weight next month. The Siazilos will follow up on her HIV status diagnosis and then encouragement to request treatment. Lweendo Siapulwe’s health is good however, the mother is still in great pain. She was diagnosed with cancer. The Siazilos are asking the church at 7 Fountains farm to assist in transport costs for mom to get to a small hospital to explore receiving appropriate pain relief. Lubono Sikanyenyene is making much progress. She is able to sit unsupported. You’ll remember she’s the little one with Down’s syndrome. Kayafa Sindunda, looked healthy however the mother said he was sick for some days. Two babies Innocent and Nkumbu were not brought however milk was given to the relatives. This is Nkumbu’s last month. He has done tremendously under the care of his wonderful aunt in Choma. Next month the number shall drop to 10. Next milk delivery will be on 21st June. Thanks for blessing these wee ones and their families! Greetings from sunny Zambia! Richard and I are grateful for safe travel and to be surrounded by a wonderful caring church family and to renew friendships with so many! It should not be so sunny this time of year. Drought is quite evident and malnutrition and hunger is beginning in some locations. Today, ZMF-C started a feeding program for children at the 4 schools we’ve been connected with over the past few years. We are grateful for your continued support and hope you will take a few extra minutes to read this longer than usual report and reflect on your blessings. While we’ve been away, Nancy and Wilson Siazilo have very capably overseen this very important piece of the ZMF-C ministry! I am the reporter for January and February to give Wilson a bit of a much needed break! He and Nancy always have many hats to wear and they it do with dignity and humility! I want to give you a picture of Nancy Siazilo. First of all, read Proverbs 31. That is Nancy. She has Godly wisdom and is productive, hospitable, and caring as a mother, wife, aunty, grandmother, neighbour and whatever other role she’s found in! There is no idleness with Nancy and she is ALWAYS cheerful. Besides raising 5 beautiful daughters, Nancy and Wilson have been foster parents to 7 other children. Wilson is a retired head teacher and is a major leader in the small church on this farm and now assists on boards, in a Christian wleadership program …more about that in February! Nancy has made great relationships with the many families that the Milk Program has blessed over the past year. Relationships are the key to any service in God’s kingdom, and she does this very well! Nancy is on the right side, along with 15 month old Loubono and mom, Olice. Baby Loubono was born with Down’s syndrome. She is only 5.9 kg, is desperately behind developmentally, but she is a BEAUTIFUL baby. Her skin is a silky chocolate brown! She is trying very hard to grasp objects and she holds her head up quite well. She has caring parents and siblings who dote on her. She has been nourished the past year through your donations to the ZMF-C milk program. As well, now she is now receiving “plumpy” nuts from Kalomo Hospital to assist with intake of additional protein and fat. Plumpy nuts are a pounded peanut mixture with added micronutrients. Charity – 4 months old, mom is young and single and unwell. Baby is gaining weight and on antibiotics. Lusyomo – One year old. Mom died 9 days after giving birth. Gaining weight well and achieving milestones nicely. Mapenzi – means “problem” in Tonga and can be used as a boy or girl name. This Mapenzi is a girl. Usually there has been a problem with the birth or something else that happened at the time of birth, therefore the name problem fits. This mom has had trouble producing breast milk. Nkuumbo – almost one year old. Mom died during child birth. Dad, David is loved and respected by many in his clinical officer role at Kalomo Hospital. Nkuumbo is sure to be a doctor. He is so alert and lively! Nkuumbo lives with his sister and aunty in Choma. Lemmy – 7 months old, mom died of childbirth. He is cared for by granny and they live a long way from SFF. Lubono – Now 15 months, Lubono was referred to the Milk Program because of chronic low weight. He’s gaining now…..though slowly. He’s 5.9 kg. Kayafa – Is a 3 month old twin boy and weighs almost 6 kg! The other twin is breastfed and not far behind in weight. So that is the picture this month for you to pray for! Please pray for the babies as well as the parents and other family members who are working hard to raise another generation of Zambians! Blessings on all of your service in the Kingdom of God! In addition to providing formula for babies in full-time care, formula is also given to families who are willing and able to care for their baby in the village. These families come each month to collect tins of baby formula and must show the health card for the baby they are caring for. In this way, the growth of the baby can be monitored. Formula is provided until the baby is one year old. As maternal care improves in Zambia we hope to see fewer deaths in new mothers….and fewer babies needing care. For now, however, this need is still great. Over the past twenty years hundreds of babies have been given a chance to live!